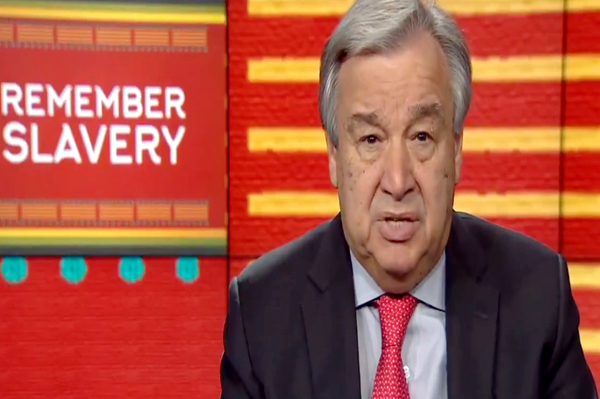 UNITED NATIONS, Mar 26 (APP):UN Secretary-General Antonio Guterres has called for raising awareness about the dangers of racism and standing up against “old and new forms of slavery” at a special event marking the International Day of Remembrance of the Victims of Slavery and the Transatlantic Slave Trade. “Slavery and the transatlantic slave trade were among history’s most appalling manifestations of human brutality”, he reminded delegates from across the world gathered in the General Assembly Hall with a call for “justice and equal opportunities for all people of African descent”. In 2007, the UN designated March 25 as a day to honour and remember those who suffered during the transatlantic slave trade (15th to 19th centuries) when between 12 and 15 million men, women and children were trafficked from Africa to the Western Hemisphere for the purposes of forced labour. “We pay homage to the millions of African men, women and children who were denied their humanity and forced to endure abominable cruelty across centuries”, Guterres said. Over the course of 400 years, more than 15 million people have been killed and irrevocably harmed “by an institution that should never have existed”, the UN chief lamented. He flagged that they were more than just victims, and often “sacrificed their lives for the cause of freedom and dignity”. The Secretary-General urged everyone to remember not only the brutality meted out against them, but also their “remarkable endurance, resilience and countless contributions” to humankind. He recalled a few of the many who “stood up against their oppressors”, citing Zumbi dos Palmares in Brazil, Queen Nanny of the Maroons in Jamaica, the Kingdom of Matamba, which resisted Portuguese colonization, and Harriet Tubman in the United States. This year’s theme: “Remember Slavery: Power of the Arts for Justice”, recognizes the contribution of art as an instrument to “confront slavery, empower enslaved communities, and honour those who made freedom possible”. Literature, music and poetry are among the artforms that commemorate past struggles, highlight ongoing injustices and celebrate the achievements of people of African descent. “Today, the artists and writers and poets who are committed to the struggle for racial equality and empowerment should know we are with them”, Mr. Guterres stated, saying “let us resolve to carry their messages far and wide” to fight racism, combat xenophobia, tackle discrimination, end social and political marginalization and “uphold human dignity for one and all”. Earlier in the day, Guterres observed the International Day for the Elimination of Racial Discrimination “to renew our promise to end racism, racial discrimination, xenophobia and related intolerance, including social and ethnic discrimination, anti-Muslim hatred and anti-Semitism”. At a commemorative event also in the General Assembly ,he recalled the New Zealand mosques massacre in which 50 were killed allegedly by a self-avowed white supremacist gunman, as “the latest tragedy rooted in such poison”, saying that last Friday he visited the Islamic Center in New York to show solidarity and express his outrage. “Today and every day, we must stand united against racial and religious hatred and the terrorism of bigots” spelled out the UN chief. Alarmed by the current rise of xenophobia, racism and intolerance being fed by nationalist and populist ideologies, he asserted that “no country or community is immune”. “Hate speech is entering the mainstream, spreading like wildfire through social media and radio… in liberal democracies and authoritarian States alike”, he underscored. The UN chief argued that “these dark forces” menace democratic values, social stability and peace, and stigmatize women, minorities, migrants and refugees – diminishing society. To combat hate speech, and “defend the principles of equality and human dignity”, Guterres has asked his Special Adviser on the Prevention of Genocide, Adama Dieng, to coordinate a strategy and plan of action for the UN system. “We need to engage everyone in dismantling the harmful and specious notion of racial superiority” he spelled out, emphasizing that the recent surge of neo-Nazi thinking and white supremacist ideology must be buried “once and for all”. This can be supported by national legislation that promotes non-discrimination, and by politicians and religious leaders who speak out against intolerance and hate speech, Guterres said. “We are all connected by our humanity. We are all equal. We should all be looking out for each other’s welfare” concluded the Secretary-General. For her part, General Assembly President Maria Fernanda Espinosa pointed to an observation of the High Commissioner for Human Rights that populists rely on demonizing the “other”, saying that across the world, “populists are exploiting the legitimate grievances of those who feel left behind”. “Hate speech isn’t free speech. It’s racism”, she declared, adding that blaming problems on migrants must be pushed back and short-sighted nationalism must not be allowed to derail the search for global solutions. “The challenges we face require global co-operation like never before”, said Ms. Espinosa. “Multilateralism makes us stronger, not weaker. The 2030 Agenda is a framework all governments can use to respond to the needs and aspirations of their citizens”.